From the creators of the world’s first frozen coffee beverage, our selection of mouth-watering Frappe Freeze® flavors lets you enjoy the same ice-blended drink experience at home. Our Vanilla mix is a popular favorite and a great neutral flavor you can enhance with your own special additions. Add fruit or fruit juice, coffee or mocha, or anything you desire. Simply delicious! 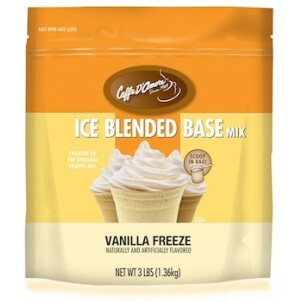 Blended-Ice Mochas and Lattes are simple to make with Frappe Freeze gourmet mixes. You'll enjoy the satisfying rich body and creamy sweetness that comes from our special, easy to use powder blends. Simply add ice, juice, fruit, coffee - anything you desire to create your own signature frappes and smoothies. Ingredients: Non dairy creamer (corn syrup solids, coconut oil, sodium caseinate (a milk derivative), dipotassium phosphate, maltodextrin, mono-and diglycerides, tricalcium phosphate, silicon dioxide, carrageenan, soy lecithin, salt), sugar, whey protein, natural and artificial flavoring, tricalcium phosphate, salt.